Patrick and Mark must fight to the death. I enjoy Battle Royale quite a bit, which, as Patrick pointed out, is kind of weird to say. I love japanese cinema in general very much, but this movie is so well done for what it is and very interesting with the things it has to say. Amidst all the Hunger Games comparisons, I saw Battle Royale when it was finally released in the states not that long ago, and I think it's a much better movie. I was attracted by the crazy concept and comparison, but stayed for the deeper themes. It's an intense ride, but definitely worthwhile if you have the stomach for it and a high enough threshold for violence. This was a good choice for a podcast, and I'm glad to hear the discussion of your thoughts on the movie. Glad you enjoyed it, John. I sort of regret not bringing up Clockwork Orange, which also gets brought up in the comparison conversation around this movie; I think that movie might be a little more similar to BR than Hunger Games is. Hmm, I don't think I've ever heard of or thought of that comparison, but it's an interesting one, and definitely makes sense. Certainly they both deal with violence among and committed by youths, and I obviously was not able to witness what kind of contraversy or outcry BR had in Japan, nor was I alive in the '70s to witness A Clockwork Orange's contraversial impact, but I can imagine they would be rather similar in that regard. They are both powerful, violent, disturbing works of art. But again, both have intriguing things to say, I feel. Actually, that movie is not the worst. Well, time to decide for one's self: Texas Rangers. The CW was seriously considering a TV version of "Battle Royale" in the wake of the popularity of "The Hunger Games," but last year's gun tragedies in Colorado and Newtown just ended that: http://www.avsforum.com/t/838060/hot-off-the-press-the-latest-tv-news-and-information/84630#post_22831013 . Yes, we talk about that on the show, which is why it can be advantageous to listen first. Weird - I have never seen this and was literally just considering buying the blu-ray deluxe set (which includes an apparently not very good sequel) as it's only $20.99 on Amazon Canada which seemed like a good price for a nice set. So, good time to ask - should I do it? I think this is available on Netflix so should I just watch it on that? I would suggest watching it on Netflix first, because it's not for all tastes. Plus, you don't want to be paying extra for the sequel since it's not very good. Watch first; if you like it, then buy it. But, most importantly, let us know what you think. Great show, I can't wait for the next segment of "Ignorance Corner"... Great joke Patrick! Hi, I'm Joe, I'm from Chicago. I don't especially like Untouchables. Brian DePalma, still coasting on Blow Out and Carrie. So that Bond documentary ignores the superior remake of Thunderball, Never Say Never Again, I assume? Random musing: anyone know where the first use of exploding collars was? Man, Takeshi Kitano (the teacher/game runner). What a lovely performance in the midst of the violence and the message (and if you haven't seen him in "Merry Christmas, Mr. Lawrence," you should). It amuses me that in Japan he's known primarily as a TV host/comedian. I'd argue that the best expression of the failure of adults in the movie is Kitano, who's in an odd way trying to make up for his failures for the beginning of the movie (or what he perceives as his failings). The movie at times feels like a commentary on something like "Blackboard Jungle" or a raft of other 50's juvenile delinquent movies , where the adults are horribly overreacting to something that doesn't seem especially that bad in aggregate/our times. Also, we need a jingle for "Ignorance Corner." The Bond documentary (Everything or Nothing: The Untold Story of 007) actually does cover a little bit of the Never Say Never Again legal mashup. I'm not in a position to say how in-depth it is, but it's definitely mentioned. Kitano freaks me out with his constantly twitching left eyelid. And now I won't be able to look at Kitano without noticing the eyelid. On another note that I just now thought of, now that I know you guys are cool with taking on foreign movies (and specifically Asian movies) I feel like a whole new door has opened for recommendations of movies to F, and I have what I feel are good ideas for the podcast: Oldboy; Seven Samurai, 13 Assassins; Crouching Tiger, Hidden Dragon; The Man From Nowhere; House of Flying Daggers; The Good, the Bad and the Weird; The Host; Rashoman; Mother; Hero; Yojimbo...The list goes on and on. Hopefully one of these suggestions will have a chance of appearing on another podcast somewhere down the line! We're always open to suggestions. We've mentioned, in brief, a good number of those on other podcasts during the "Have you seen anything good lately?" portion. Yep! I've heard, and I think that's what attracted me to some of those titles. Just holding out hope that they may get their own podcasts someday. You're welcome! I saw Jack Reacher the other day due to the praise its been getting on the show and appearing on Erika's honourable mentions list......and I didnt like it at all. I thought it was a typical Tom Cruise vehicle attached to an over long CSI script (neither of which I am a fan of). The character, on paper, seems to have been written as a rough and gritty "Man with No Name" style, but that Tom Cruise refused to play it any other way except as Tom Cruise super cool clean shaven flawless hero. And the lead actress was not good at all. Im putting this down to the whole expectation thing. You guys seem to have gone into it with low expectations while I went in with the expectation that this will be a little gem. The truth is probably somewhere in between, except Im not going to be watching it again to see it for what it is. Boy, was Gangster Squad lame. I agree with you that Penn was bad but I would also say the same about Gosling. His baby voice really bothered me - very actor-y. Also, Emma Stone falls in love super quick in that movie...WTH? I've been saying "Lawuss Ayanjelus is my DESTiny" all week. Kill Bill may owe its "blood fountain" effect to Shogun Assassin, but Shogun Assassin may well owe that effect to Kurosawa's Sanjuro. In a climactic scene, Toshiro Mifune slashes the chief bad guy with his sword, and a ginormous gout of blood comes surging out of the wound. From what I understand this was actually a mistake (the pressure for the blood effect was set way too high), but it looked so incredible on screen they elected to keep it. Let's hear it for happy accidents! It's been a long time since I last saw Sanjuro, because I remember those movies as being bloodless. Now I need to watch it again! Patrick, I bought this on Blu-Ray as I left Best Buy,, during Scary Movie month. It was cheap, and I hadn't seen it in a while (Plus I've been telling my Hunger Game Fanatic Soldiers they should watch this instead) Funny thing is I only watched the first 10 minutes and stopped because it was Scary Movie Month. Thanks for giving me a reason to finish it. Patrick, you should start a separate series of podcasts called Ignorance Corner where you speak with a heavy southern accent and your guest chooses another cultures accent and you praise movies like Birth of a Nation not only for it's importance in cinematic history, but also for it's message. Mark Ahn is Korean? I always thought he was Asian - GO FIGURE. 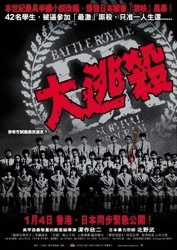 So I watched Battle Royale last night (and listened to the podcast today) and I definitely liked it - like Mark, I think I will benefit from a second (and third and...) viewing to pick up on some of the finer points, but it's definitely a good movie and very watchable. I will admit to being just a little distracted early on by thoughts about kids killing kids in real life - the first time it happens especially - but because it's such a well-made movie I was able to get past that pretty quickly. Ignorance Corner thought: You guys noted that these supposedly BAD kids seemed like pretty normal teenagers. Yeah, they might seem like normal AMERICAN teenagers but like, by JAPANESE standards (and Mark can back me up here), they were in need of severe discipline, what with their laughing without covering their mouths and looking their elders in the eye. And for any aspiring actors out there, this movie serves as a Master Class in COLLAPSING IN DESPAIR and RECOILING IN HORROR and FLAILING WILDLY IN DEATH AVOIDANCE. Anyway I definitely give it a full Honey Boo Boo's Niece (3 thumbs up - HA!) and I look forward to watching it again sometime with your guys's comments in mind - thanks! Also don't forget the incorrect angle of salutary bows. I would have a heart attack if a bunch of Asian kids showed up in a school wearing BR uniforms. After I get out of the hospital, I will look back and enjoy it. I agree with you about the Requiem scenes. I was very confused when those first came on. I, too, saw this as a bootleg sometime around 2002. At first I thought the prologue was actually the ending and the whole film was a flashback. Wasn't the case. One thing that has always puzzled me is why when Mitsuko dies (shot multiple times, cuing Bach on the soundtrack) does her name appear "Mitsuko dead" followed by a "?" Since I assumed the prologue was the ending, I kept waiting for Mitsuko to come back. Didn't happen. One reason why I didn't purchase the blu ray box set is that it doesn't have the special edition of part 2 in it. I find it odd that both versions of the first film are included, but not the second. Sure, the extended version can't begin to solve the mess of problems found in the sequel, but it would have been nice from a completionist point of view. Back in 2005, I was working at a public high school. For Halloween, all of the asian students came dressed in Battle Royale school uniforms. No one knew who they were dressed like, but I gave them a knowing nod. They were shocked that I knew. Seeing them altogether was quite a sight. I just finished BR. Now i can listen to the podcast. Stanley Donen's CHARADE (1963) on Blu-ray: http://www.dvdverdict.com/juryroom/viewtopic.php?f=50&t=6028#p74508 . My 7-word review: Let's scare/terrorize Regina half-to-death. Now I know what inspired "The Condemned." HEY that had Stone Cold Steve Austin. It's funny how everything has a way of coming back around.